It’s here!! It’s here! Finally, after weeks of preparation, long hours, sweat and tears, the One Room Challenge reveal day has finally arrived. 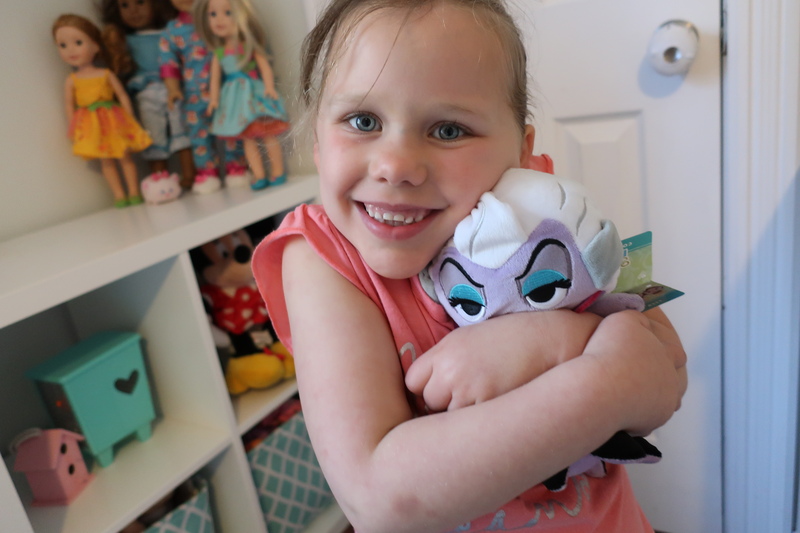 It still doesn’t seem like it was 6 weeks ago that I started the journey to find the perfect paint color and then the quest to the perfect accessories for Madeline’s Mermaid Room. I hunted high and low and found some pretty amazing pieces, and both myself and Ms Madeline are thrilled with the results. She was over the moon when I revealed the room to her yesterday, and I was happy I was able to get her reaction on film. So let me back up a little bit. 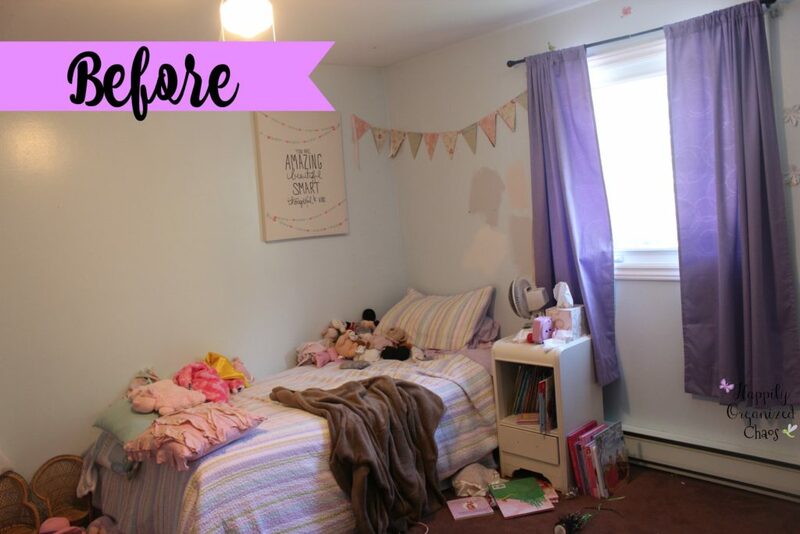 If you are not familiar with the One Room Challenge, a lovely blogger over at Calling it Home challenges bloggers and designers to redecorate a room in their home in a mere 6 weeks ( this Fall challenge has been 7 weeks). It is a mad dash to the finish line but we all make it in the end. I participated in my first challenge last spring and am now completely hooked! 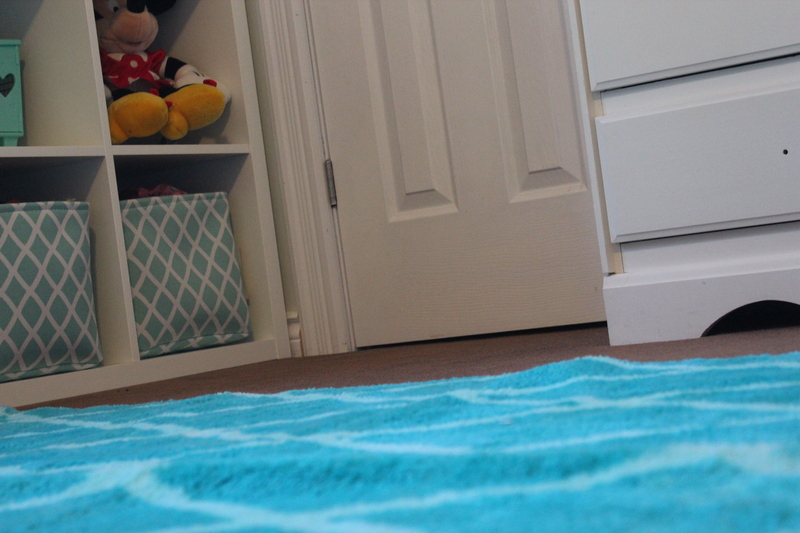 ( Check out my Master Bedroom makeover here ). If you are just joining me on this journey, then make sure to catch up on all the previous weeks first before you see the reveal. Here is the before picture so you will have an idea of what we were working with. So the quest to find certain items was a difficult one to put it lightly. 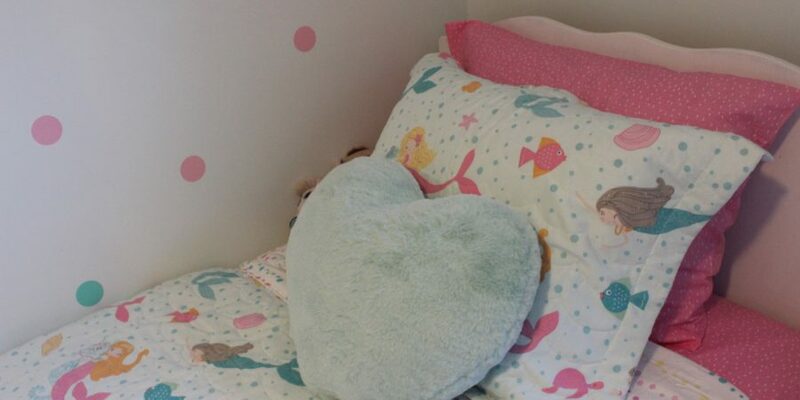 Although, the one thing that wasn’t an issue and was really the starting point for the whole room was the bedding. 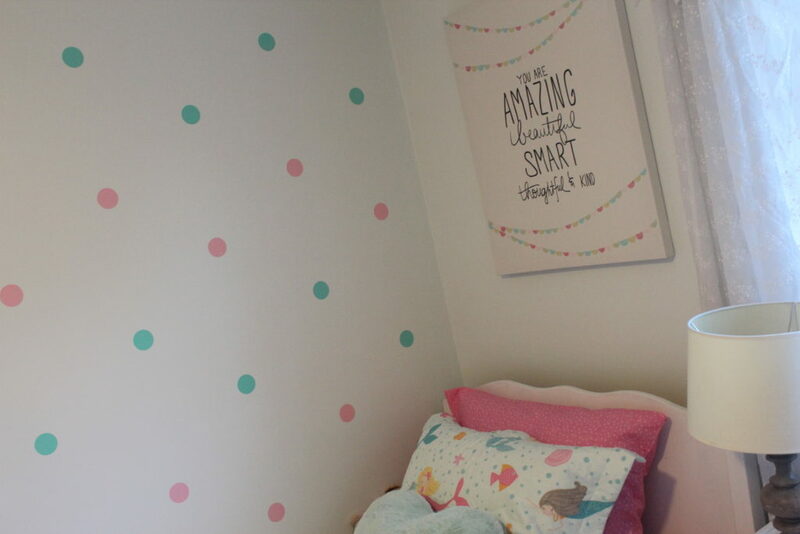 When I decided that I was going to redecorate Madeline’s room for this challenge, I wanted her to have a lot of say of what goes into the room. 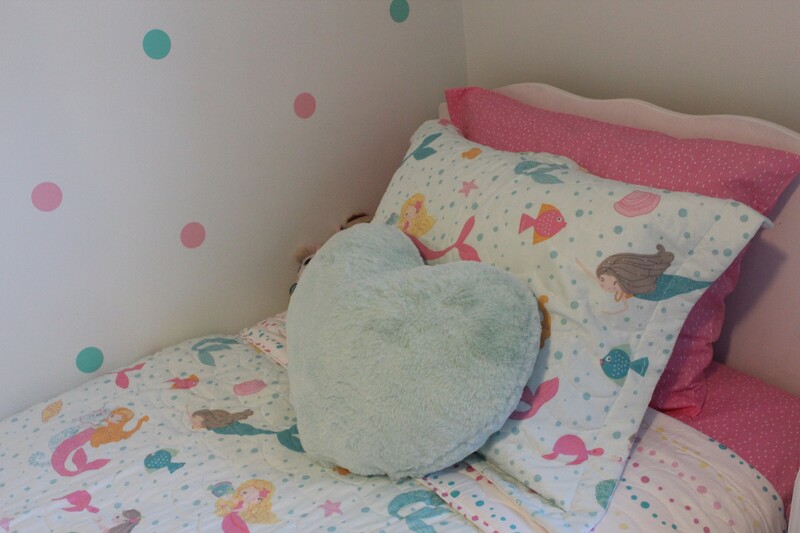 She loves Mermaids and when we both saw the Little Mermaids Coverlet set from QE Home | Quilts Etc. we both knew it was going to be the perfect jumping off point for the entire theme of the room. 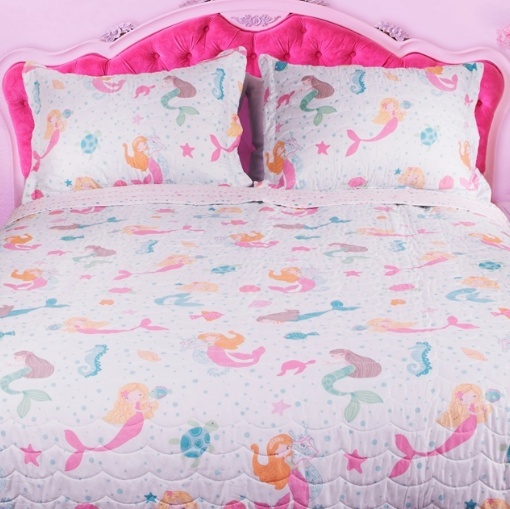 The Little Mermaids coverlet set is absolutely beautiful. The colors are a perfect match to Madeline’s personality and we both love that we can still have our pink accents in the room. The quilt has mermaids all over it (and I think that is Madeline’s favorite part) and what I love about it as well, is that the filling is 50% cotton and 50% Polyester, making it light weight but still warm and the shell is microfiber, making it so soft to touch. QE Home | Quilts is a Canadian company based in Vancouver, BC and I love the fact that I am supporting a Canadian company. They have 70+ stores across Canada and if you find something on the website that is not available in store, no need to worry- just order it online and have it shipped to your local store free of charge, it is just that simple to get beautiful bedding at affordable prices. Once we found the bedding, it was a little difficult to find some of the other items in the room to be honest. Living in a small town, it is sometimes hard to find specific things. I searched for weeks on end for the perfect rug that was in budget and wasn’t having any luck until we went on a mini vacation to Halifax and I found the most perfect rug. I swear it was made for the room. I decided to give the room some extra special mermaid touches with some DIY. 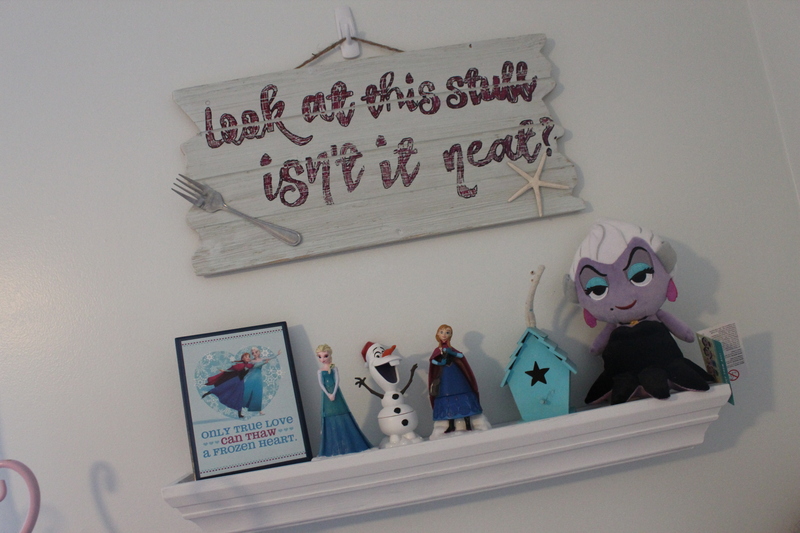 I made this sign (which Madeline loves) and picked up some special new items for her freshly painted shelf. I decided to keep the bookcase pretty minimal and only store a few things on it. 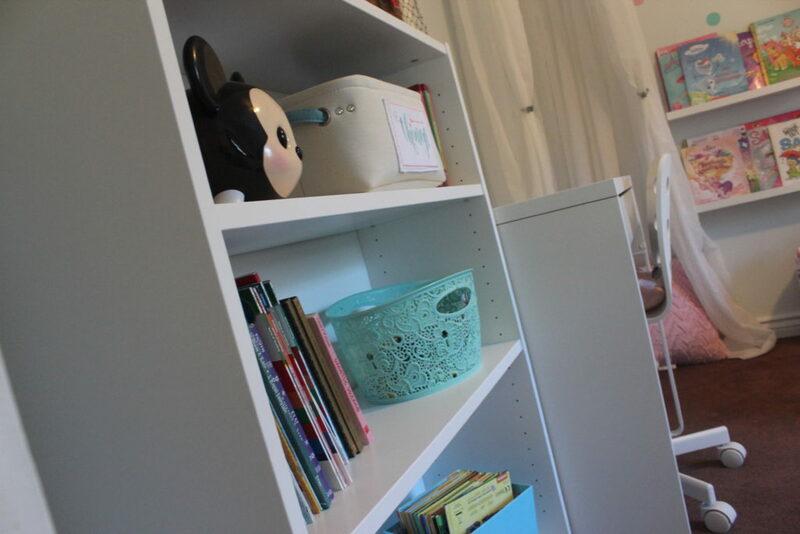 The desk and bookcase are from Ikea and we both really like them. 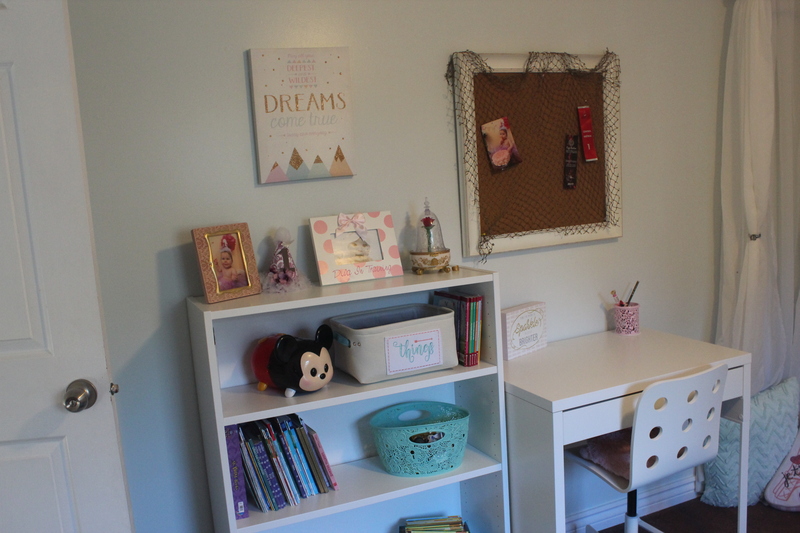 The memo board is from Michael’s Craft Store and I simply added some netting to make it a little more nautical and perfect for a mermaid room. Also, can we take a moment to talk about these decals and how they coordinate perfectly with all the colors in the room! A lot of love, sweat and tears went into this room but it was all worth it in the end to see this face and her reaction. 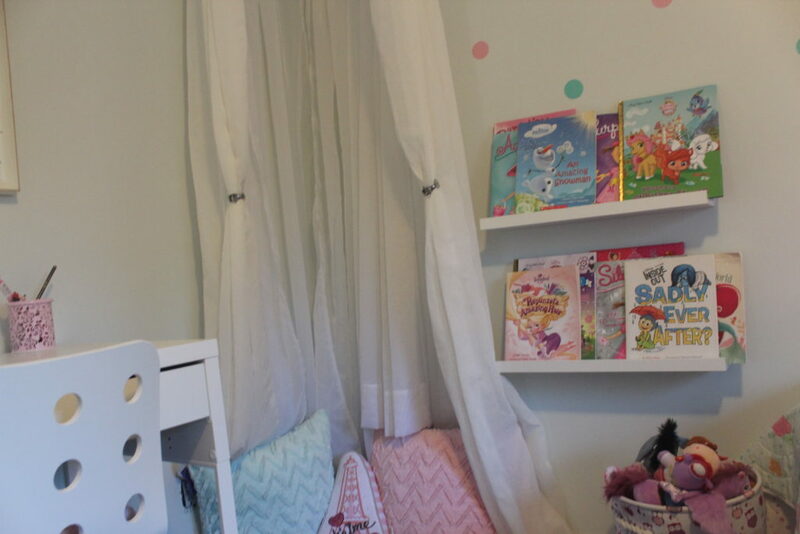 I will leave you with pictures of the room completed now, because I know that is my favorite part of reveal day and don’t forget to check out the video down below to see her reaction to her new room and a tour! Thanks for joining me on this 7 week journey to completing the perfect mermaid themed bedroom for my sweet and energetic little princess. As always, take care. 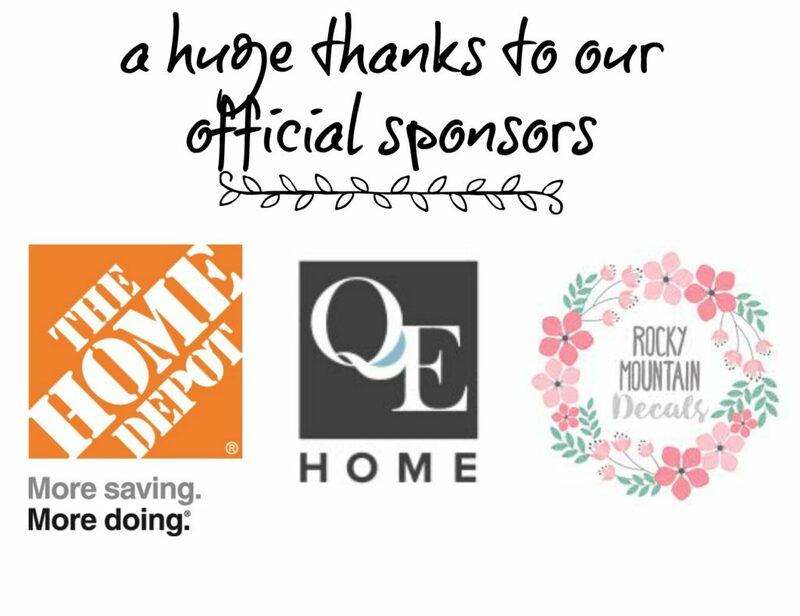 Disclaimer: This is NOT a sponsored post but the bedding was given to me by QE Home |Quilt Etc., Home Depot kindly provided me with gift cards to purchase the paint and the wall decals were given to me from Rocky Mountain Decal Company. All opinions are my own. So cute!! I love that wall!! Great job. 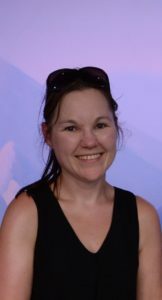 Hi Amanda, Thanks for stopping by and that wall is amazing isn’t it?! 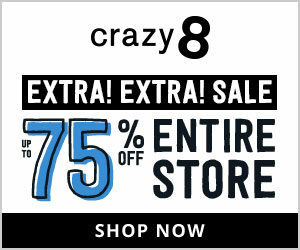 We just love it! So sweet! The happy smiles from your little girl makes it all worth it! She loves her new space! Way to go Mom!!! 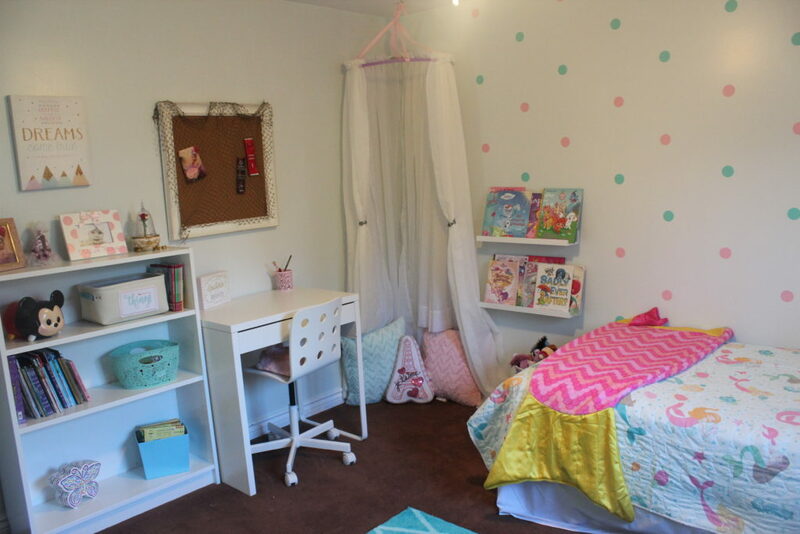 How sweet this room turned out! Your daughter is going to love it. Well done! Hi Libbie, Yes, she does love it!! Thanks for stopping by!! A little girl paradise! 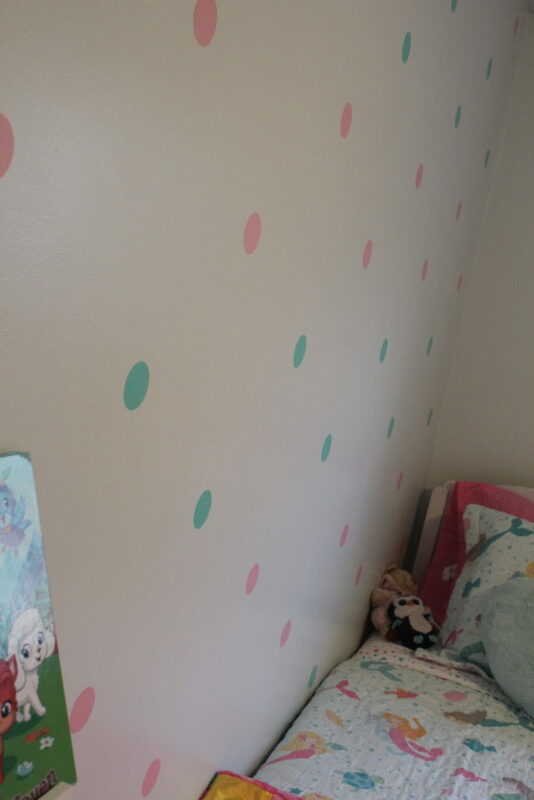 How cute is that polka dot wall!! 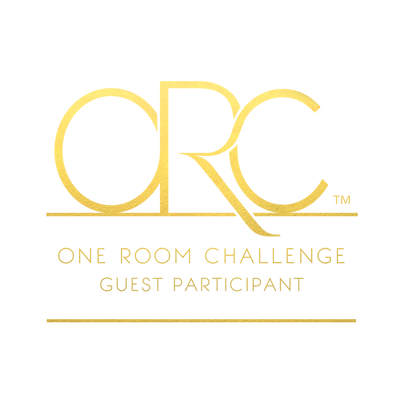 I know, isn’t that wall amazing!! She looks happy in her new space! Very sweet. Thanks for stopping by!! Madeline is very happy with her new room. Oh what a cute and adorable space! 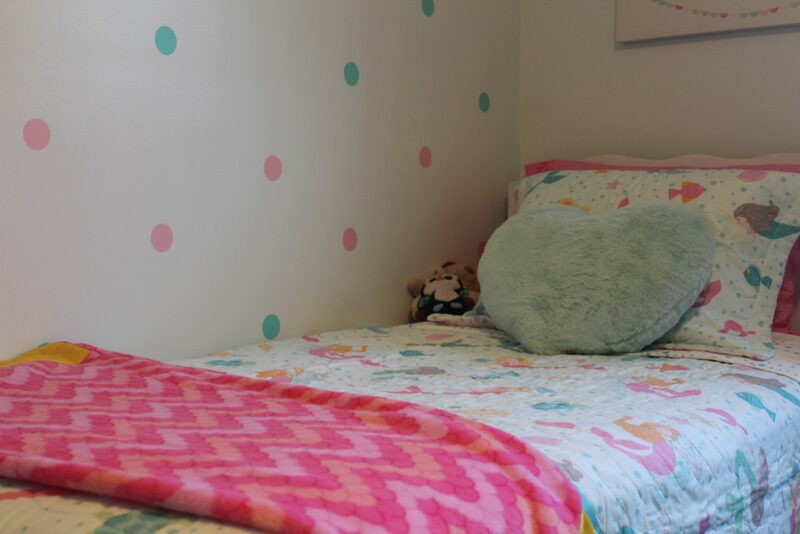 I love the polkadots on the wall – they tie in perfectly with your bedding. I am sure your kiddo just loves it! Hi Kelly, thanks for stopping by. 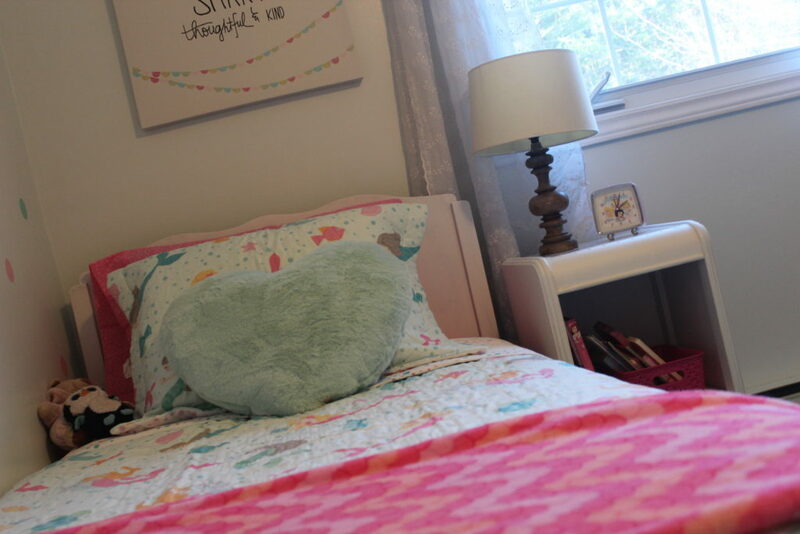 Yes, Madeline loves her room and is now even making her bed to keep her new room looking great!! I love seeing her excitement in the video. Kids’ rooms are so fun! 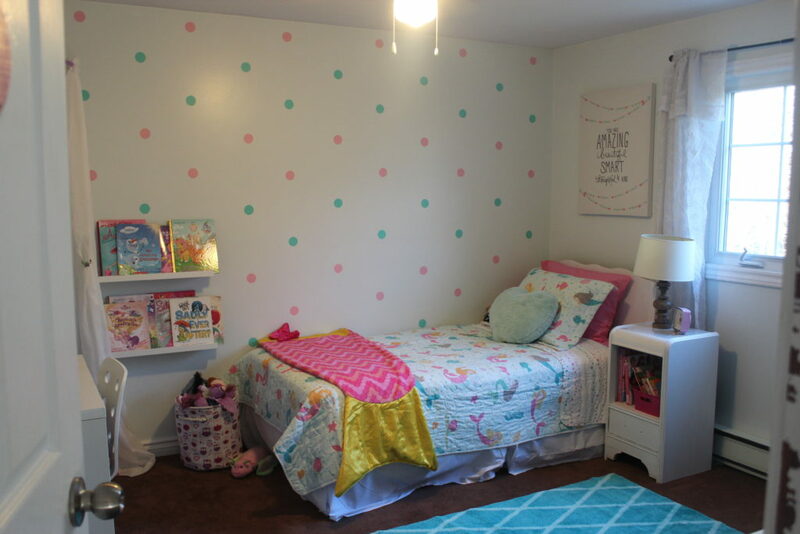 Love the polka dot decals on the wall and all the little “mermaid” accents. Great job! Previous Post One Room Challenge Week 6: So many things, so little time!